Skea Eggs is an egg-packing and marketing company which operates in the agri-food industry to supply major retailers across Northern Ireland and mainland GB. What started as a small family-run business founded by Matthew Hayes in the 1970s has grown to become a leading supplier of eggs with more than 140 employees. That family ethos has continued. Matthew Hayes is the current Managing Director. Always abreast of industry trends and legislation, Skea Eggs continuously implements new policies and standards. What began as a wholesale business with eggs with family farms is now a supplier of 9.5 million eggs a week to supermarkets. 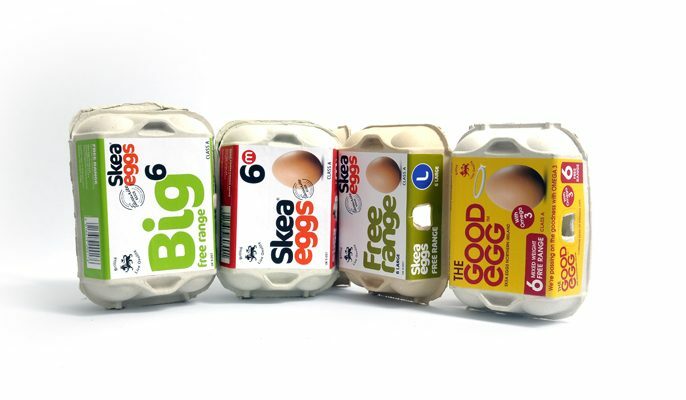 Skea Eggs 10 Pack, 6 Pack, Large 10, Big 10 Cage, Good Egg Medium W, Skea Medium 6, Free Range Large 6, Skea Big 6 Range and Skea Big 10 Range. Tesco, Asda, Sainsburys, Musgrave Retail Partners, Co-Op, Marks and Spencer.